St. Sarkis, Diaruntarch (Presentation) and the power of Testimony. Scripture: Luke 21:10f - "Not a hair will be touched on your head..." says Jesus. Sermon by Fr. Vazken Movsesian on February 16, 2014. 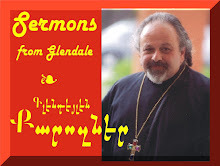 Delivered and Recorded LIVE at the St. Peter Armenian Church & Youth Ministries Center in Glendale, CA. English language at minute 12:27. Sunday, February 2, 2014 - On the treasures around us. On this Super Sunday, Fr. Vazken speaks about focusing on the treasures that last for eternity. It's a heart-mind experience. Also - guests from Argentina bring to mind the universality of the Armenian Church experience. Recorded LIVE at the St. Peter Armenian Church in Glendale, California.